One of our favourite décor options is revamping and re-cycling furniture that has become outdated or simply worn by time. Creative décor can be achieved through changing the covering of a single piece of furniture, making all the difference to a room. We can provide you with a host of fabric options to achieve just the feel you want to for your furniture. 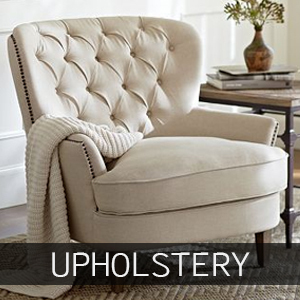 Bear in mind that often reupholstered furniture can be more expensive than new pieces. This is because they are not mass-produced at low cost and are essentially “one-off’s” and unique pieces which you won’t find in the high street. Whatever style of furniture you need custom made, we can produce it to your specification at extremely competitive prices. Ranging from sofas, dining chairs to custom built-in wardrobes. Before rushing to buy replacement furniture, talk to us about options available for your current and loved pieces of furniture.